Merriweather Lewis wrote on his 30th birthday that he felt empty and bereft of accomplishment. That was well after he and the Corps of Discovery had made their amazing journey across the continent. Turning 30 can be tough. But surveying the dawn of autumn this morning, I am encouraged. Walking among the plants today did bring back to me why one might become disheartened. A blackberry field is as full of pitfalls and peril as John Bunyan’s Vanity Fair. The first I came upon was a flagged plant that we are monitoring for a nasty little bacterial infection that can alter the DNA of the plant and require burning of said plant and sterilization of the soil around it if confirmed. It is easy when confronted with peril in the morning to despair, and I have had my share of those mornings when it seems no good can come from this day. The next peril on my journey around the field was the site of a repelled intruder. The mole came under the wire webbing but was repulsed before he got to the delicious blackberry plant roots. Catching a mole like this feels a bit like Gandalf standing on the Bridge and shouting to the Balrog “You Shall Not Pass.” We farmers carry strange notions about our work. Much of farming involves the ability to weigh life in the balance and decide what must live and what must die. Bindweed and crabgrass must die in a blackberry planting and our applications of soap and vinegar seem to be holding it at bay while the sorghum in the aisles is growing tall and shading out any weeds that might try to grow there. Despite a good deal of peril and death, there is much to hope for as the season changes. The beautiful rains of the season have the field moisture at about 70% capacity as measured by our wonderful little tensiometer, and the understory of perennial grass which will replace the sorghum in the aisles is sprouting nicely. Last of all Nick and Alex got the patch trained up and looking rather lovely from its state of overgrowth last week. So despite all the woes attendant upon the children of men I feel some good may come of it all. Hope can change rather quickly into celebration. 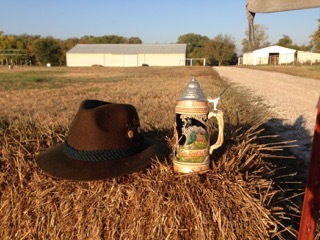 Thus as harvest is waning and winter begins to loom, mark your calendars for the annual OKTOBERFEST here at Elderslie on October the 24th from 4- 10pm. This is a family gathering with food, beer, a live band and group dances. If you also sometimes feel the pangs of peril sapping life’s hope, join in the fun and celebrate the bounty of our Creator and the hope of another season. Tickets will be available on the Elderslie website October 7th.